ORSINO, CURIO, and other lords enter, with musicians playing. If music be the food of love, play on. Give me excess of it that, surfeiting, The appetite may sicken, and so die. That strain again, it had a dying fall. O, it came o'er my ear like the sweet sound, That breathes upon a bank of violets, Stealing and giving odor. Enough, no more. 'Tis not so sweet now as it was before. O spirit of love, how quick and fresh art thou, That, notwithstanding thy capacity Receiveth as the sea, nought enters there, Of what validity and pitch soe'er, But falls into abatement and low price Even in a minute. So full of shapes is fancy That it alone is high fantastical. If music feeds love and makes it stronger, then keep playing. Give me too much of it, overfeed me until I get sick and die. Play that part again—it sounded melancholy. Oh, it sounded to me like a sweet breeze blowing over a bank of violets, stealing their scent and distributing it to everyone. That's enough now, no more music. It doesn't sound as sweet as it did before. Oh spirit of love, how restless you are! You make me want to accept everything, like the sea does, but then the next minute everything seems worthless, no matter how valuable it is. Love is like a hallucination—nothing else is so imaginative and extravagant. Do you want to go hunting, my lord? Why, so I do, the noblest that I have. Oh, when mine eyes did see Olivia first, Methought she purged the air of pestilence. That instant was I turned into a hart, And my desires, like fell and cruel hounds, E'er since pursue me. I am already hunting a hart, but it's also my heart being hunted. Oh, when I first saw Olivia, it seemed to me that she purified the air with her very presence. In that instant I was transformed into a hart, and ever since then my desire for her has pursued me like a pack of cruel hunting hounds. What's going on? What's the news from her? So please my lord, I might not be admitted, But from her handmaid do return this answer: The element itself, till seven years' heat, Shall not behold her face at ample view, But like a cloistress, she will veiled walk And water once a day her chamber round With eye-offending brine —all this to season A brother’s dead love, which she would keep fresh And lasting in her sad remembrance. I'm sorry, my lord, they wouldn't let me enter, but Olivia's handmaid gave me this answer: the outside world won't see Olivia's face for the next seven years. She'll wear a veil like a nun, and once a day she'll water her room with her tears. All of this is to preserve her love for her dead brother, whose memory she wants to keep fresh forever. O, she that hath a heart of that fine frame To pay this debt of love but to a brother, How will she love, when the rich golden shaft Hath killed the flock of all affections else That live in her, when liver, brain, and heart, These sovereign thrones, are all supplied, and filled Her sweet perfections with one self king! Away before me to sweet beds of flowers. Love thoughts lie rich when canopied with bowers. Oh, if the heart inside Olivia's beautiful body loves her brother this much, then imagine how she will love me once Cupid's arrow has killed all her other emotions except love! Her mind, heart, and body—each of them a precious kingdom—will all be ruled by one man—me! Now take me to a garden of flowers. My thoughts of love will be strengthened by a beautiful setting. Cosby, Matt. "Twelfth Night Translation." LitCharts. 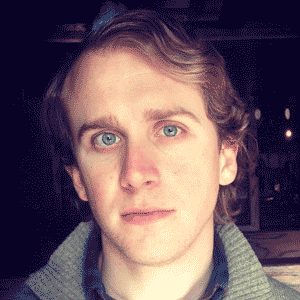 LitCharts LLC, 11 May 2014. Web. 18 Apr 2019. Cosby, Matt. "Twelfth Night Translation." LitCharts LLC, May 11, 2014. 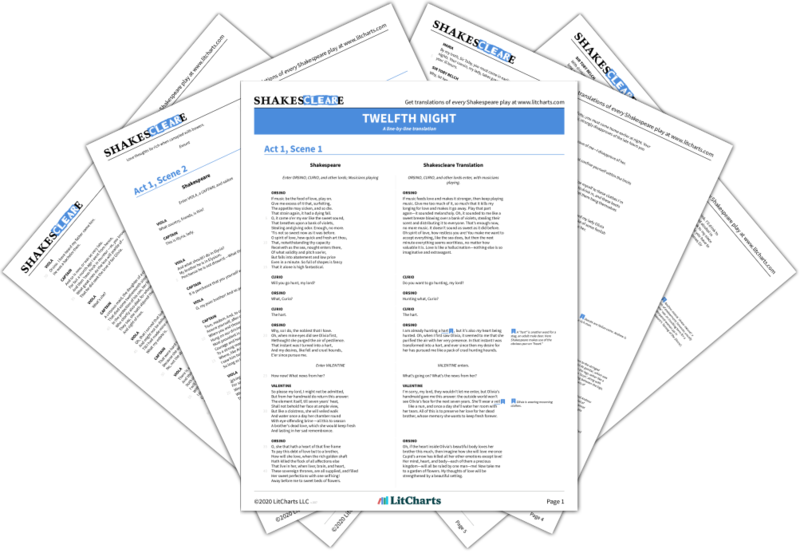 Retrieved April 18, 2019. https://www.litcharts.com/shakescleare/shakespeare-translations/twelfth-night.